Trump tweeted today - "Apple prices may increase because of the massive Tariffs we may be imposing on China - but there is an easy solution where there would be ZERO tax, and indeed a tax incentive. Make your products in the United States instead of China. Start building new plants now." The tweet was in response to Apple telling trade officials in a letter on Friday that the proposed tariffs would affect prices for a "wide range" of Apple products. Let's compromise all that we hold dear to publicly kowtow to a madman on the assumption that speaking reason to him will keep the madness in check and ensure profit. Typical failed hotelier. Thinks everything can happen 'right now' because he screams louder. Does he even KNOW how long it takes to set up a chip fab, or an automated assembly operation ? mess with our precious iphones? now THAT may get him thrown out of office for sure! LOL, he and other conservative wannabee business owners led the march to outsourcing a good chunk of our manufacturing to China with their short sighted greedy desire for increased profits. None of them complained when Walmart (and to a lesser extent others) further pushed the remaining few manufacturers out of this country because they wanted increased profits for their shareholders. This is a Republican hypocrisy foisted on this country. LOL, he and other conservative wannabee business owners led the march to outsourcing a good chunk of our manufacturing to China with their short sighted greedy desire for increased profits. LOL, What a pile of clueless BS, spoken truly like a Democratic Koolaide swiller, a wannabe progressive, unable to take responsibility for his ideas, instrumental in driving out the businesses he now tries to blame. Most of the stuff that went to China in the last 20 years was not because of low wages, but due to the cost of doing business and inflexibility of our over regulatory system driving out the basic manufacturing infrastructure to places like China. It's not just about cheaper wages? No. Wages actually aren't that big a part of the cost of making consumer electronics, according to The Times. Paying American wages to build iPhones would add only about $65 to the retail price of each handset, according to analysts' estimates. That's an amount Apple could likely afford. And in fact, China no longer offers rock-bottom wages. But when it did, it used that window "to innovate the entire way supply chains work," says Sarah Lacy at PandoDaily. China is now "a place other countries can beat on sheer cost, but not on speed, flexibility, and know-how." What does China's competitive edge look like in practice? One example from The Times article: When Jobs decided just a month before the iPhone hit markets to replace a scratch-prone plastic screen with a glass one, a Foxconn factory in China woke up about 8,000 workers when the glass screens arrived at midnight, and the workers were assembling 10,000 iPhones a day within 96 hours. Another example: Apple had originally estimated that it would take nine months to hire the 8,700 qualified industrial engineers needed to oversee production of the iPhone; in China, it took 15 days..
"Basic manufacturing" may look like waking 8000 staffers up at midnight for a rush order to a big company, but there are many pockets of America (read: pretty much ALL of America) where our standard of living won't allow that, politically, philosophically or ethically. A more elegant arrangement would be for each consumer to individually decide not to do business with Apple. Outsourcing = gone, iPhones, gone (or more expensive and updated less frequently, or both). That begs the question. If "every" consumer rejects outsourced products, that's functionally the same as society rejecting it en masse ... via regulation. The only difference is whether or not the individual believes it was their personal choice. China produces ten times as many college graduates as the U.S. and they don't have our pesky workers rights and pollution laws. It is now the largest labor market and the largest new car market. Apple opened a factory in India to bypass their tariffs. I don't see why they can't make here at least some large percent of the products they sell here. More college graduates in no way implies, let alone equates to, abetter educated work force. They have more laborers? That's a clue. Especially coming from a country with China's record of squashing ideas and thought. I don't see why they can't make here at least some large percent of the products they sell here. "We're going to maximize capitalistic profits everywhere except this arbitrary portion we'll designate The Feelgood America Portion." I wonder ho shareholders would feel about an American company that willfully left money on the table in order to make the America First crowd feel better. More to the point, what does it mean for American to be First if and when its corporations willfully forgo profits? Dont repeat the idiotic crap peddled by arm chair bound idiots who never understood the context, Chinese started long after us and moved a lot faster then we have. They announced the new environmental standard several years ago and gave the industries involved two to three years to achieve them. In the last three years they totally shut down about 30% of small and medium businesses for noncompliance with their new pollution standards. The carnage continues as we speak. I personally know of several large manufacturing operations with the state of art water treatment plants surpassing anything we have, yet they still got flagged. Five years ago they pretty much shut down an entire generation of coal powered smelting plants, Thousands of companies over that previous five years. What we did in fifty years they are getting done in twenty. Any company has a choice to make. If costs and regs are too high in America, they can either cease operations or outsource. . The subject was taxes (scroll up to the top, if unsure). You tried to make it about everything else, without citation nor examples. The link you provided mentioned no regulations that stymie innovation or whatever. Replying is not a game of, "Guess everything max really means." I realize companies go overseas because they must, to remain doing business at whatever level they are at. My either-or decision tree still stands; they either can, or cannot. Curiously weird attempt to correlate anything I've ever said with how Trump may think. Comical, if it weren't so clueless. Edited 1 time(s). Last edit at 09/09/2018 04:31PM by deckeda. Workers heading home from work in China. Edited 1 time(s). Last edit at 09/09/2018 09:16PM by Carnos Jax. China's ability to make massive change in issues like the environment is amazing. I am cautious that there is real appetite when graft is still so common a way to avoid regulatory implementation. 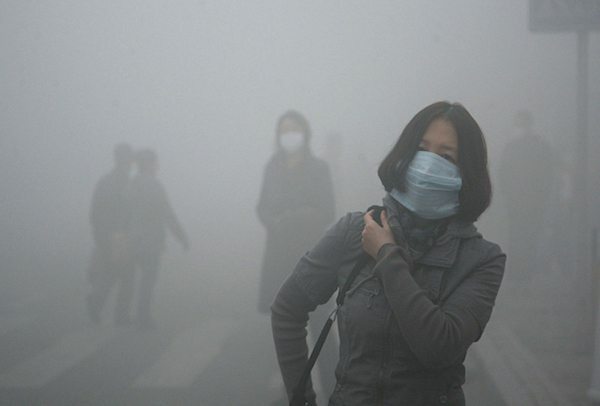 As Speedy shows, the air in some cities is as bad as being a chain smoker in the US. My allergies are triggered just landing in Shenzhen airport.